Jamie Alley, Anne Evasick and Chelsea McCarthy know movies. Tacked to the wall behind the counter of Island Entertainment is a collection of rental slips from the video store’s most distinguished patrons. One shows Jacqueline Onassis renting the 1969 British costume drama Anne of a Thousand Days. Another lists five movies checked out by Dan Aykroyd, including Titanic. However, when royalty entered the store, owner Anne Evasick was so star struck she dispensed with the usual protocol. Despite royal visits and a once devoted following, Island Entertainment will end its run in March after 32 years in business. It is one of the last stores of its kind nationwide. 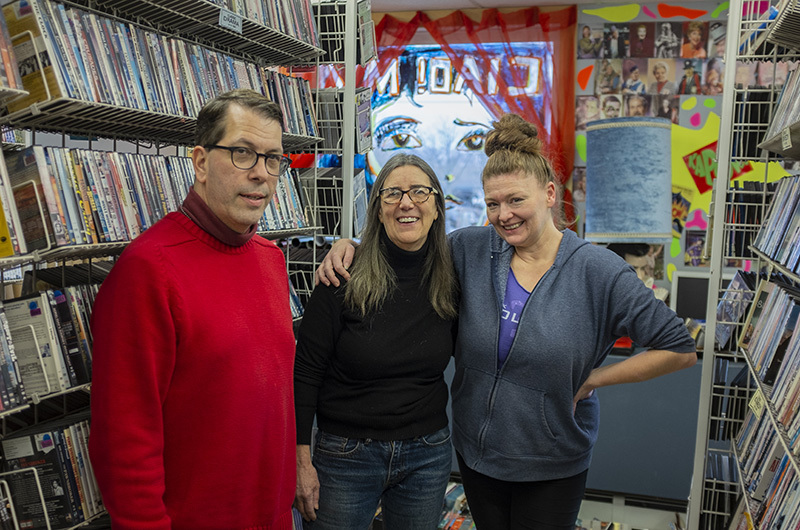 Ms. Evasick pointed to major changes in the distribution business over the years as the impetus for her decision to close, particularly the growing availability of cheap video streaming services. Island Entertainment was founded in 1986 by Bob Dutton, and Ms. Evasick was one of the first employees. Business was so good back then, Mr. Dutton soon moved to a larger, two-floor space on State Road, with the downstairs devoted to musical offerings. After working on and off at the store for more than 20 years, Ms. Evasick bought it in 2008. But with the rise of Netflix she moved to a smaller location across the street in 2013. 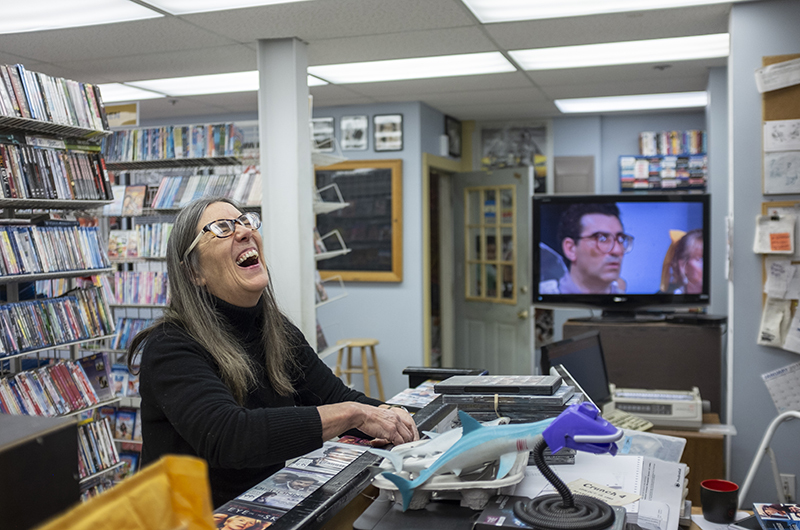 She fondly recalled the “glory days” of the 1980s and 1990s when Islanders made movie pickups part of their weekly routine and the store averaged 1,000 rentals a day. Ms. Evasick said the first VHS tape made available to rent was Top Gun. Since then Island Entertainment’s library ballooned to 30,000 titles, running the gamut of cinematic genres, from Scandinavian thrillers to slapstick comedies. The store houses its fair share of nostalgic objects, too, reflecting employees’ personalities, including longtime manager Jamie Alley. One wall is covered with photos of every Batman villain that has ever graced the silver screen. An Elvis lamp sits by the front window. Ms. Evasick still uses the same computer and dot matrix printer from when the store opened. “If we had a roundtable of everyone who had ever worked here . . . oh the stories they would tell,” she said, recalling when customers would call the store to settle movie arguments. “People just don’t want to take the time to browse anymore,” she added. Ms. Evasick said one of her favorite parts of the job has been giving movie recommendations. Just last week, after getting a request for a movie with a charming storyline and happy ending, she moved quickly through the aisles knowing exactly what she was looking for and where it was placed. She came back with a stack of DVDs and a big smile. The movie selections included one about competitive jigsaw puzzling, another about animated dogs stuck on a Japanese island and her personal favorite, Brigsby Bear. “I don’t think an algorithm is going to give you that selection,” she said. Ms. Evasick said she’s still working out the details of the closing, including whether she will sell or donate her vast collection. She said packing has already begun and she hopes to be ready to say goodbye at the start of March. After that, she’ll move to a full-time job at Edgartown Cinemas to continue sharing her passion for movies, just without the late fees. Bob Dutton, Island Entertainment, where else? Though I birthed this child and raised it through its first four years of life, Anne and Jamie nurtured it thereafter and really became the parents, allowing it to find its unique character, its sense of self. The goal from the beginning was singular: to give the customers more than they expected. Ironically, I believe Island Entertainment gave me more than I expected. Alas, it seems the future has spoken: "Video stores? Where we're going, we don't need video stores." I opened an account at Island Entertainment when it was on Union Street. My account number is in the low 100's. In those days of yore I don't know what would have become of me on those long, cold, winter nights without Island Entertainment. Farewell. I can proudly say I am the last person to have ever rented Face/Off from Island Entertainment. There aren’t many places where a mere $5 can get you 2.333 (repeating) hours of Nicolas Cage playing John Travolta playing Nicolas Cage. Godspeed, Anne Evasick. You and your store will be missed. I am the typical terrible Island Entertainment customer: showing up maybe a couple of time a year, overwhelmed by the incredible selection and then not coming back. But every time I drove by and saw the notable window displays, I was so grateful that this business was still up and running. Hearing this sad news hits the nostalgia PLAY button: "One day, back in 1896, I was crossing over to Jersey on the ferry, and as we pulled out, there was another ferry pulling in, and on it there was a girl waiting to get off. A white dress she had on. She was carrying a white parasol. I only saw her for one second. She didn't see me at all, but I'll bet a month hasn't gone by since that I haven't thought of that girl." There is no algorithm to make up for thethe loss of this Store. There is no replacing the community you’ve created. We love you Anne! Ohhhhh Nooooooo! How we will miss it. Thank you so much for entertaining our family for decades. Your insight and happy dog greetings cannot be replaced. Best movie recommendation: The Well Digger’s Daughter. Staff selections are my favorite! Out custom was to walk in, describe our weekly guests and take home the perfect recommended film to suit everybody’s taste! My husband enjoyed the dogs! An island tradition that we will miss! 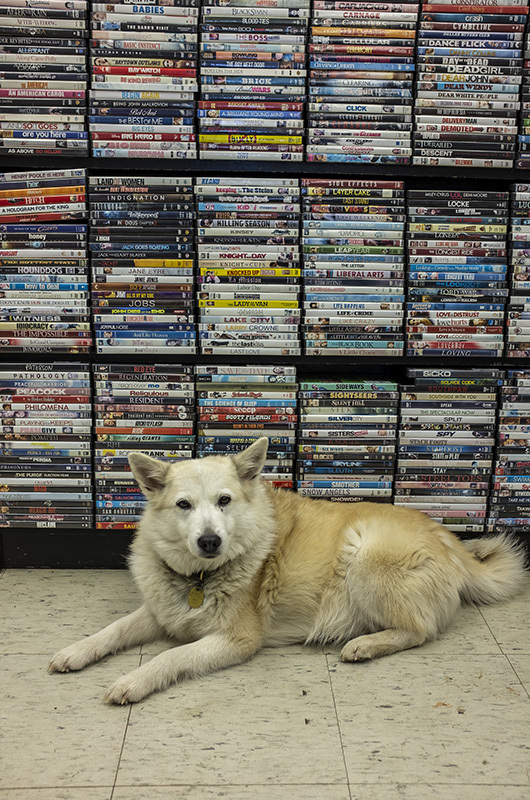 Island Entertainment will forever be one of the best video stores anywhere. Not only is the Island loosing one of its truly unique gems, the world is loosing an eclectic film library. What will become of all those obscure films we will never again be able to find on video streaming? Thank you, Anne and Jamie for creating a delightful home for this vast collection of films and videos, the likes of which the world will never see again. Just a simple but very heartfelt thank you for all the joy and pleasure you brought to my family. Thanks for the memories and movies! All the best to you all! I came to the Island in 2002, and somehow was privileged to inherit a double-digit membership number. Our family enjoyed getting DVD's and our daughter (who was raised on dark comedic movies)is now a ImProv performer and serious writer in Chicago! Thank you Anne and Jamie for all your creative work in our quirky community! How sad, Anne, but inevitable, I know. I guess that’s progress, but there will be a big hole on the Vineyard where Island Entertainment used to be! Best of luck with your new adventure! Steve Boyleston, Summerdale, Rairhope Al. Today., Vudu , Netflix, and technology make it obsolete to go drive to a store, sitting on your sofa,, buy the movie right there. There was a Time The Video Store anywhere was great, those days have passed, other things will follow more and more. Often, technology can be ruthless. Though I’m an infrequent visitor to the island I always made a point of stopping in and renting a few titles at this wonderful-last if its kind-video stores. I would always arrive assuming it would have gone out of business since my last visit, and was always pleasantly surprised to see it still hanging on. It will be greatly missed. Like you Ian, when I came to the island I was always pleasantly surprised that it was still there. I will miss it. Great dedication keeping it open this long. This is another loss of community. Loved taking my time viewing the incredible collection of films. Real archives created and managed by real talent. Thank the Universe we still have you, Anne, with your bright spirit and your discerning eye, at the Edgartown cinemas and the MV Film Festival! I always treasured my (1)007 account number, even if I was an infrequent customer. The community you gathered was a great one for people, dogs, and employees (perhaps a separate sub-species? ), which benefitted my son, Elliot (the Dust Devil) in many ways. Thanks for your enduring commitment on so many levels! Island Entertainment was an exciting and productive partner for this writer to hook up with back in 1987. The Times played matchmaker and the affair lasted for years, racking up tens of thousands of words on newsprint in the long run. Still have scores of "Fast Forward" columns tucked away in an album somewhere. This is one of the most moving obits I've ever read in the Gazette. Too choked up to go on right now. RIP IE. I too remember the early days of Island Entertainment, and the excitement of waiting for my name to get to the top of the list so I could rent a new release! I have one of those three digit numbers. It's so sad to truly see the end of an era, but it was a darned good run. Thank you so much for being there for all these years. Though we can’t remember things at times, we have never forgotten our account no#, nor the simple joy of island entertainment Jamie and Ann and all of the faces we remember behind the counter; we will miss you! Netflix was a forbidden word in our house one time Anne came home and Peter and I were watching a show on Netflix. Let’s just say we were busted big time. I hope Anne’s collection ends up some where that people will be able to access all those great movies. No more “ Do u have that movie with the guy with the red hair. Or that movie where the guy dies . We may need start a movie question hot line. Most of all I may get to spend more time with Anne. And Moonie May lose some weight. I was the second employee at Island Entertainment, starting upstairs at Union Street, while I was still in high school. A formative time in my developing appreciation of movies. It’s worth remembering that Bob, Anne, and Gene were dedicated to making sure that they curated a collection that included a large selection of foreign, independent, documentaries films and oddities that were hard to find anywhere. I remember, the collection was lauded from the beginning by summer visitors, who were routinely shocked and impressed at the breadth of the collection and that that they could find movies in Vineyard Haven, that they couldn’t find at video shops in the large cities they hailed from. In the days before the ubiquitous availability of all media provided by the internet, Island Entertainment was the source. Congratulations on a long, amazing run. I remember being so excited when my family bought our first VHS player (we had Betamax beforehand) so I could finally browse the movies at Island Entertainment. And Nintendo games! What a relief it was to play games without having to beg my parents for $50 a pop! We rented "Tienamen Square" for my son's in-laws on their first visit outside China. They had heard rumors that something terrible had happened but the government only said the students were violent criminals and no pictures were shown inside China. They asked if we could find the film for them. We didn't expect Island Entertainment to have it - but you did!. The smuggled film clips and interviews with former student activists were shocking to these kind people - they were very emotional.The infamous image of the student standing in front of the tank being run over...it haunts them to this day. The King family were member #39, and were frequent patrons when we lived in VH in the 80's and 90's. We mourn the loss of this Island institution. Wishing you all the best in your future endeavors. Thank you for your service!